A decent camera which has a manual mode (can control aperture and shutter independently). Your camera should also have a hot-shoe or ‘pc sync function’ to allow use of external flash. You would also need at least one flash; don’t worry if you don’t have it right now you can get one on the way. For this you won’t need to break your bank account and you can use any of the cheap manual flash out there. We will come to a recommendation soon. PC sync is used mainly by PWs (Pocket Wizards) to communicate; this is not much of a problem, one can get ‘Hot Shoe to PC Sync Adapter for External Strobes’ (these are very cheap) at most online store like gadgetinfinity.com or you can buy it locally at Jayesh or RK in Bangalore. Let me share my full setup; I use ‘Canon 350D’ body and have one flash (also known as speedlite/strobe) - ‘Vivitar 285HV’. 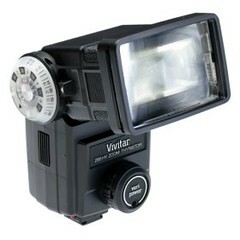 Vivitar 285HV (aka 285HV) is a manual (non ttl) flash; its cheap ~ INR 3500 (~90USD) provides full control (power settings from full power to 1/16 power). Vivitar 285HV is just a example and you can use any flash that provides basic control of power and provides Hot Shoe or pc-sink connection option. Always remember Strobist principal #1 “Less Gear”. So we don’t need expensive ttl flash (if you want you can use them.. but all one needs is a manual flash with variable power (optional) with a Hot Shoe or pc jack. If you have more or higher end ttls) flashes it provides you flexibility thats all. First we need to move the light source away from the camera axis. For this we use triggers; these basically connect at one end to camera and other end will connect to flash. Initially all these looks very complex and intimidating… but soon it will become second nature and you will enjoy every bit of it. And even when you don’t have a flash.. you can use strobisim; having understanding of light and shadow helps one to see a seen differently and appreciate available light. Where do I place my off camera flash? Well let me tell you my secret… I normally and whenever possible use what is known as ‘Voice activated light stand’. These are very flexible and come very cheap. This can be models friend, your fellow photographer or your spouse, so make use of whatever is available. The ‘Bongo Elastic Ties’ (come part of the kit) are very helpful to hold your flash on to any available thin object. This kit also comes with ‘Umbrella Swivel’ that I use to hold my umbrellas and flash on the stand. Metering with a manual flash / off camera flashes. Note: Most flashes when used as off camera under normal condition with say radio/optical trigger are reduced to manual flashes. This happens since ttl connection is not covered or available in most off camera communication modes. Unless you use some sort of ttl cord to communicate with camera and flash or use other means to get the ttl data to the camera you will need to rely on the manual way of metering described below. So how do you meter the camera with flash being in play? During a flash photography session there are two distinct planes of light that need to be metered and captured by your camera. Okay; now to keep things simple lets not take iso setting into account and keep this constant for this exercise. But do note that you can extrapolate the same and use iso control to control the overall exposure. Another important thing to note is something called ‘flash sink speed‘ of your camera. This is typically around 1/200 of a sec to 1/250 of a sec depending on the brand of your camera. So what does this mean? All it means is that this is a max shutter speed you can use with flash without any of the shutter curtain closing before it completely opens. To put this in plain English; if you use shutter speed above this and use your flash one of the sides of your frame will not get the flash and would end up becoming black band under normal conditions. There are few ways to cheat this .. mainly if your camera uses digital shutter. Go through Strobist post for more info; this has been explained very well by David. Another thing to note is that its easy to work in a manual mode of your camera when working with flash and I highly recommend it. One can work with other moves like tv or av.. but its not easy and you will be struggling changing exposure compensation. Okay.. now enough of theory.. hope you guys have not slept off.. lets get to the real thing. As said earlier.. there would be two different planes of lighting areas one needs to meter for during a flash photography session ‘the flash lit area’ and ‘ambient lit area’. Keep this in mind the shutter speed controls your ambient part of the exposure mostly and adjusting the aperture can control the flash lit part of the frame. You may be wondering why is that? Think about this the flash lasts only for a 200th frication of a second so any small change in shutter speed would not effect amount of light falling on your sensor/film. So the amount of light that is falling on your frame can be controlled using aperture. And since the ambient part of the exposure is continues.. one can control this using shutter speed. Now lets take an example. In the above shot we have a sunset with a flash lit model in the foreground. So I change my camera mode to manual mode and meter for the setting sun and the blue sky. My Canon350D has a sync speed of 1/200; but I can’t use this with my radio triggers since there is a small delay in communication, so I get small black band if I shoot at 1/200. So I set my shutter to 1/160. Now I adjust my aperture till the exposure is good. One may need to adjust the iso, if the lowest aperture does not provide good enough exposure at the shutter speed you are working. Now we bring the flash in from camera left and say start with half power and take a test frame. Now check the exposure; if the flash lit area is under exposed we can try two things. Either open up the aperture if your lens allows or increase the flash power to full or move your flash bit closer to the subject. If you decide to increase the flash power then you may need to increase/close down your aperture to compensate for the increase in power. With couple of tries one can arrive at the proper setting to get the desired effect. Always keep in mind there is no perfect exposure here. It all depends on what you are looking to capture, like I have bit under exposed the ambient to get deep blue colour here. Also the background could have been made lighter by using an even slower shutter speeds, or by cutting the power ratio and opening the aperture a bit instead; this would have provided bit more detail in the background. Now you guys know; why the 2nd line in strobist tag line is called “more brain”.. i.e because we use our brain to control the look we get for our picture and not some computer chip in the ttl flash. Here you can view my full set of photos where I used Strobist principals . So happy clicking .. hope to see some great stuff from you guys. Please do feel free to correct me if I have put something wrong here or have missed some thing. *1: PC connector has nothing to do with PCs, It came from a collaboration between Prontor and Compur to put a common flash sync connector on leaf shutters they made. Thanks to Henry for letting me know about this. Photographs displayed here are copyright protected (All right reserved) and I own the copyright (except the pictures of gear). You may only use it in its original form for personal use on your computer. The images should not be reproduced, published, transmitted in any forum or in print or in any other physical or electronic forum either in part or in whole without the explicit written consent from the copyright owner. Legal action will be initiated against any individual, organisation, institution, agency, publishing house, etc. who violate the Copyright laws including but not limited to those mentioned here and use the image for any commercial/non-commercial purposes. If you would like to use any of the photograph displayed here commercially or would like to use for any other use please do contact me. Cool, man. Thanks much for the shoutout! Very useful information, made much easier to understand for beginners. Thanks! Help you in your pursuit of light by providing you with a quick start guide to Strobisim. So what this will do is tell in a very basic form what Strobism is and what are its principals and what it can do for you and your photography…. Nice synopsis of The Strobist method! any pointers regarding the high speed sync mode with the SB-800? thanks David, Surendar, Seshu for dropping by.. appreciate the comments. Thanks for the simple write-up on Strobism. I was going through Strobist.com and needless to say that I was getting mad with the amount of information. I wanted some Bangalore way of explaining it. I got it here. Need your expert advice on the following query.. I went to Naresh asking for Speedlight, he gave me following options. Which one will you suggest for Strobist need..
Also, what would you suggest for triggers? Can I buy Cactus V2 with Jayesh or Naresh or something else is there? Asking your advice considering your expertise in this area. By the way I have met you in Prem sir’s house. Very cool and useful writeup dude! Cheers lots, I have found this info extremely good!